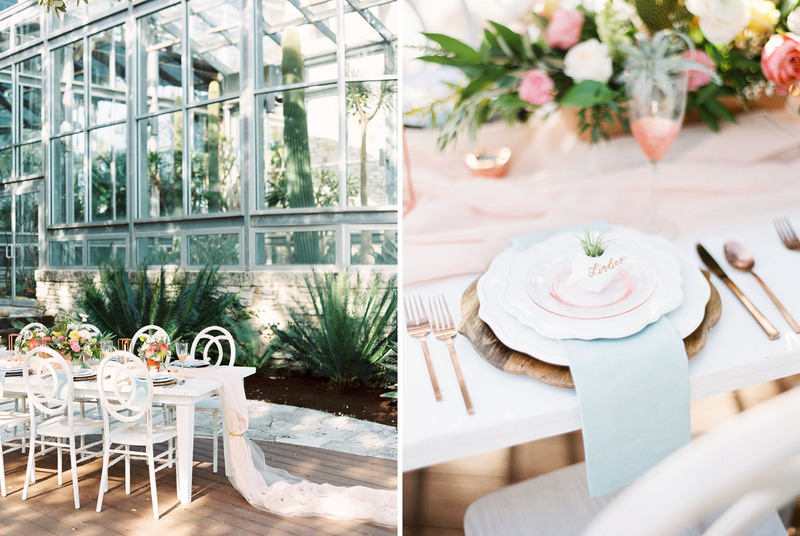 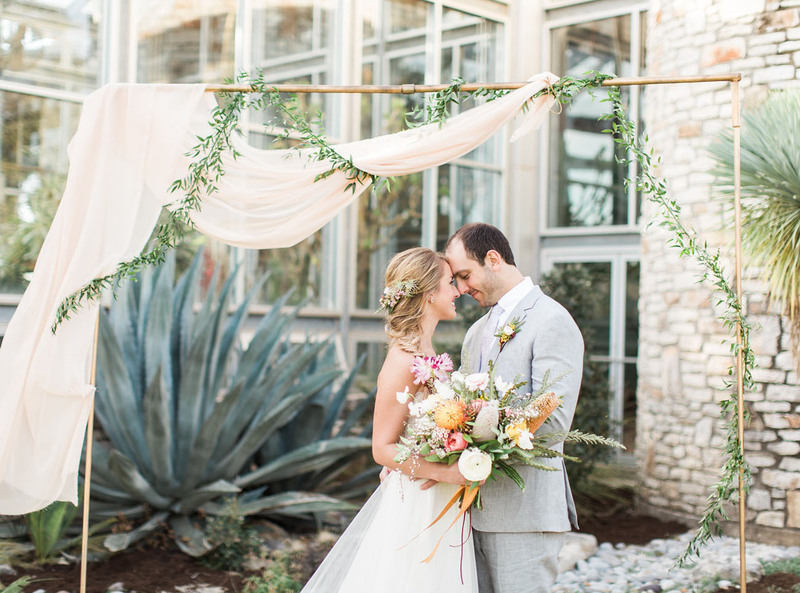 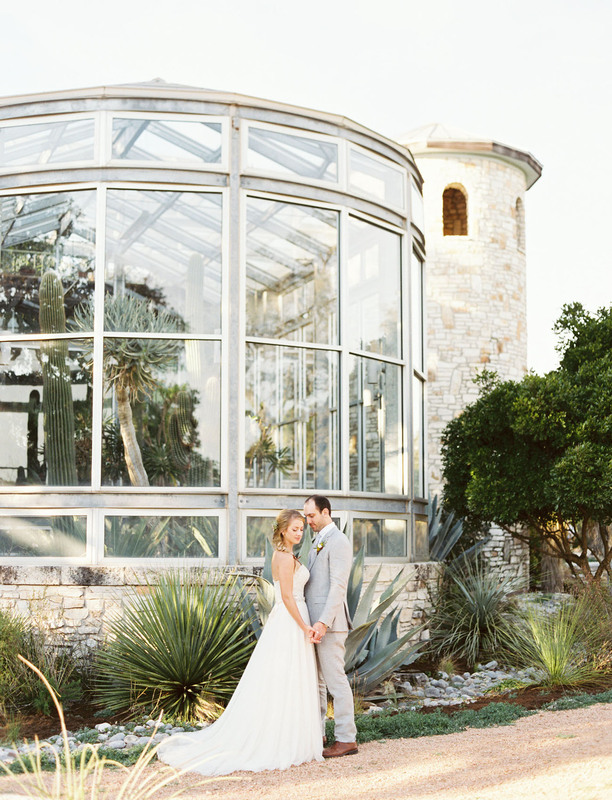 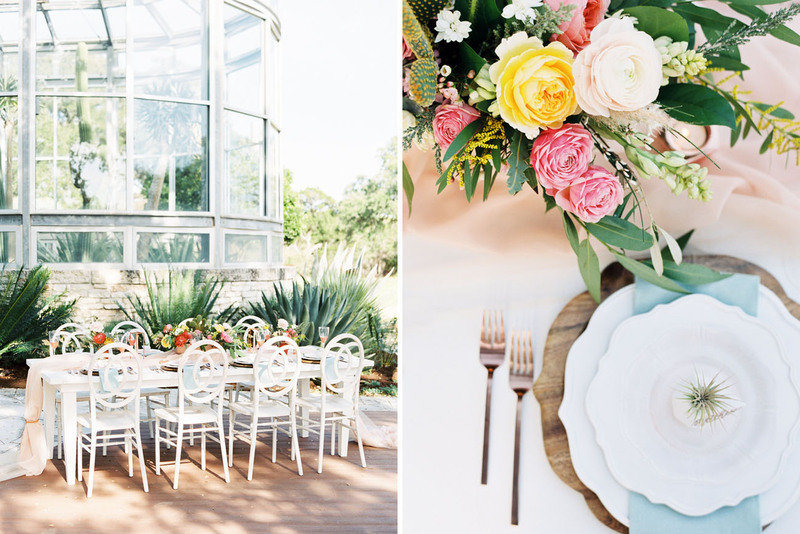 Always down for a good greenhouse backdrop, we love how today’s styled editorial takes that location (specifically The Greenhouse at Driftwood in Driftwood, Texas) and makes it even more gorgeous and unique thanks to stylish metallic + leather details, amazingly lush floral design and a perfect, elevated-boho vibe. 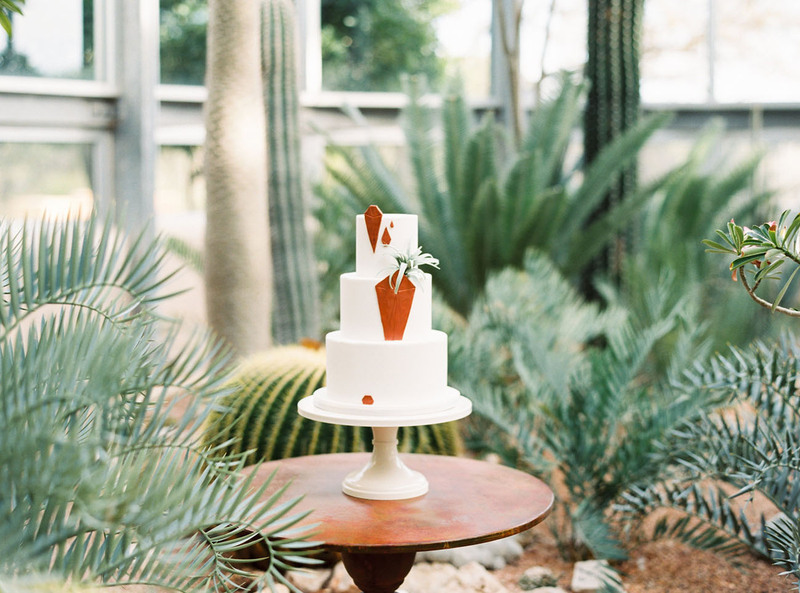 The designer behind the beauty, Lindsey of Highland Avenue, says, We created an environment that built upon the already existing beauty of the space, and highlighted the outermost greenhouse full of desert plants and cacti. 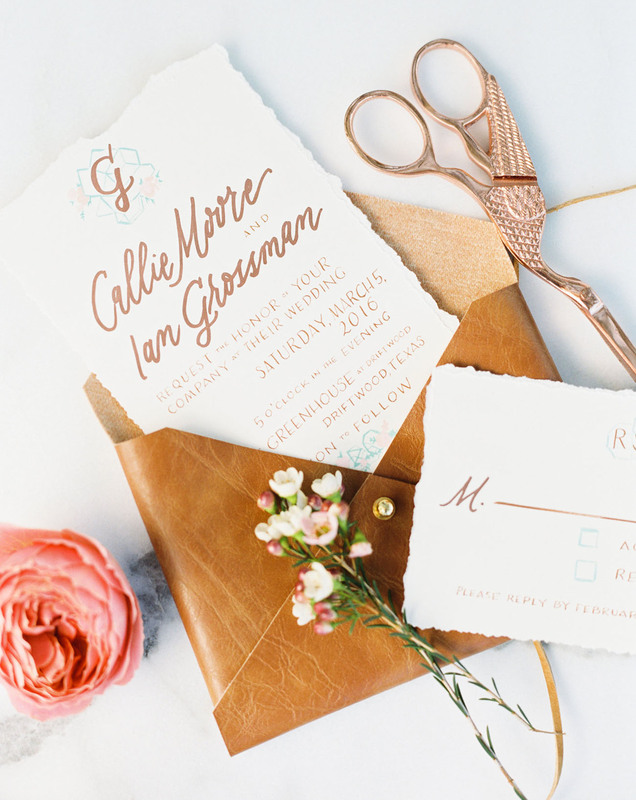 Incorporating touches of copper and leather helped to pull in the southwestern feel while keeping the overall design clean, light and airy. 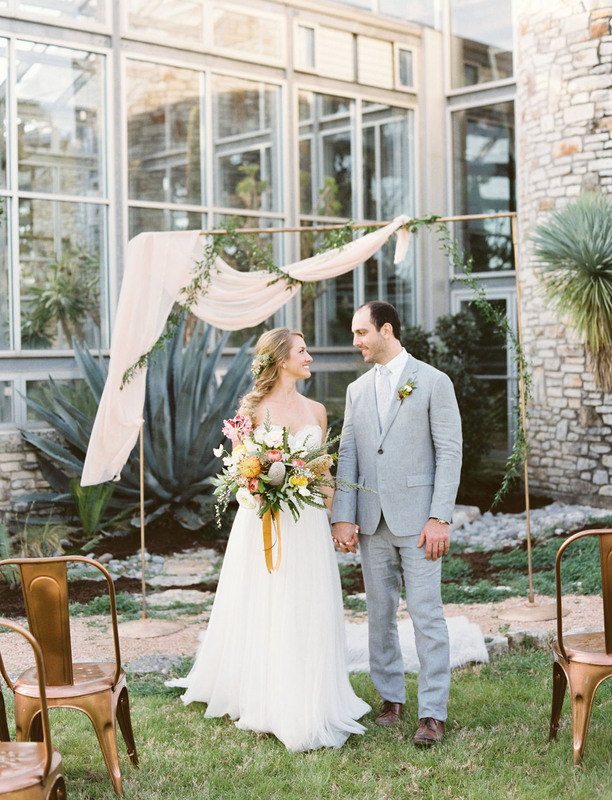 In order to allow the venue to shine in the background, we kept the ceremony simple with loose flowing greens and fabric, lamb’s wool, and copper. 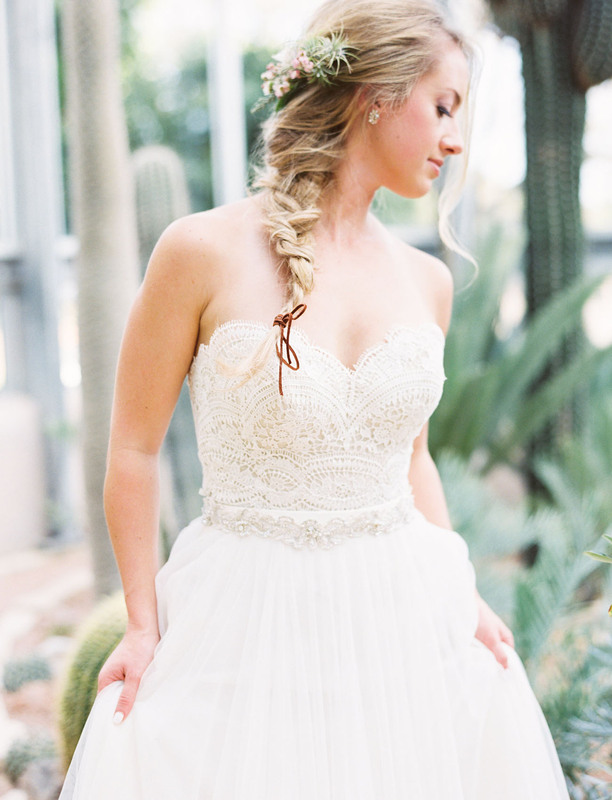 The bride’s corset & skirt from BHLDN were breezy and beautiful in the afternoon light, and we adorned her hair with air plants and leather to tie in the motif. 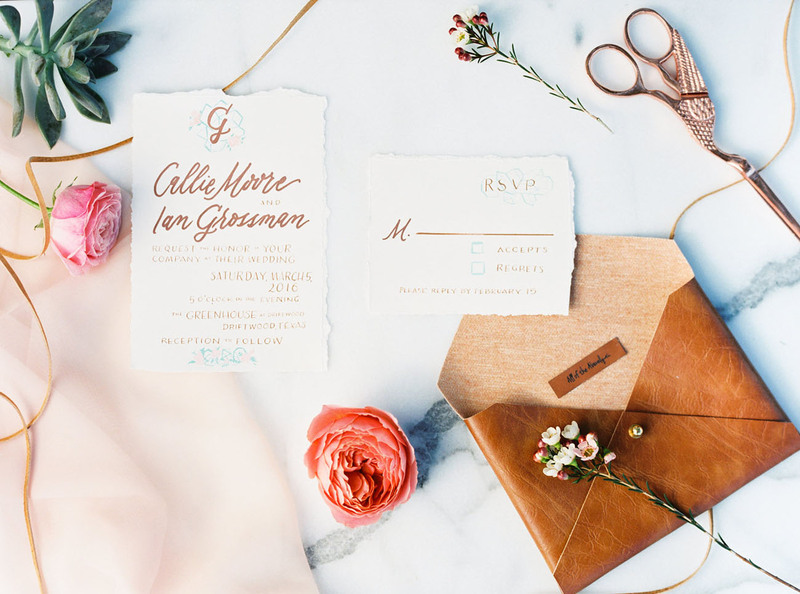 This stunning suite, by J.RoCro arts + letters, is winning us over big time! 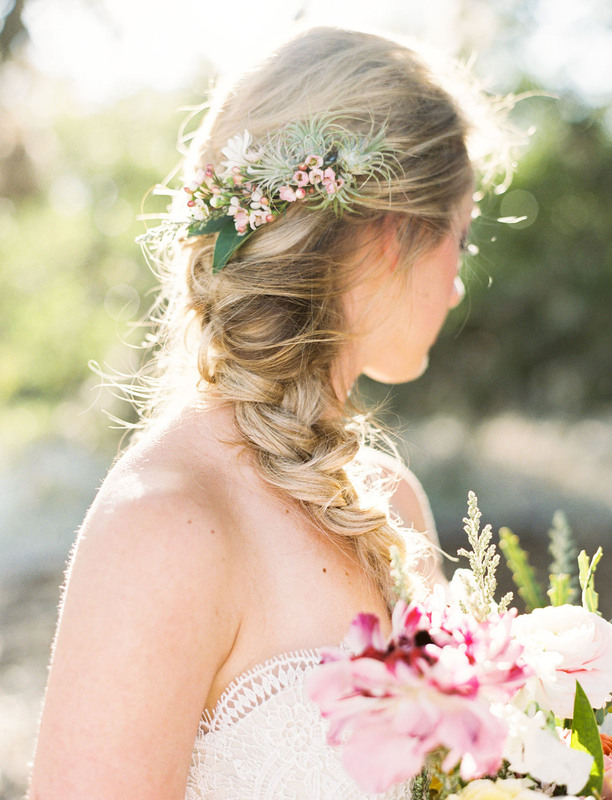 Such a pretty braid by Angela Parker of LucieMarie – tied stylishly with a leather string! 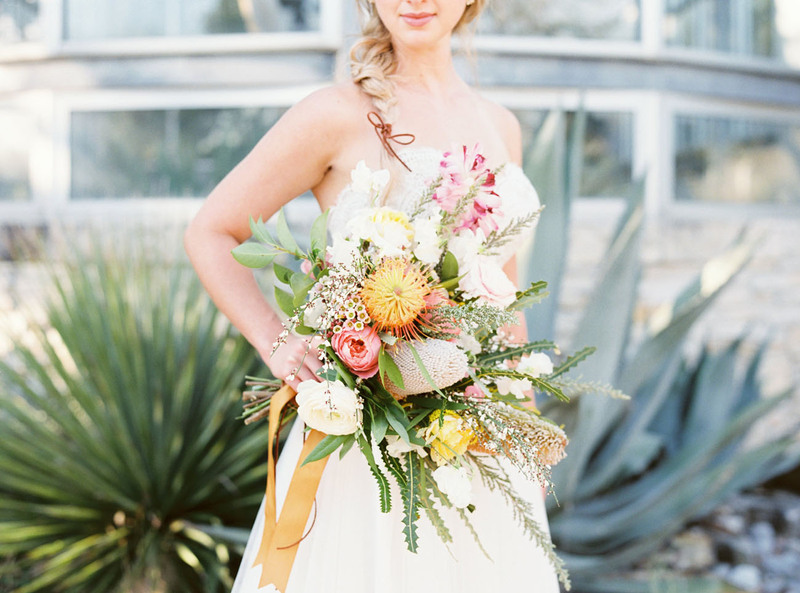 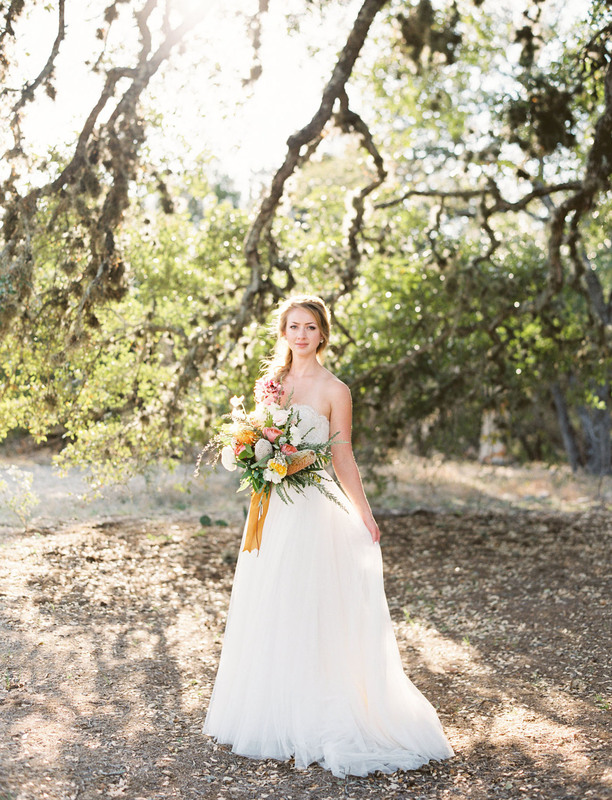 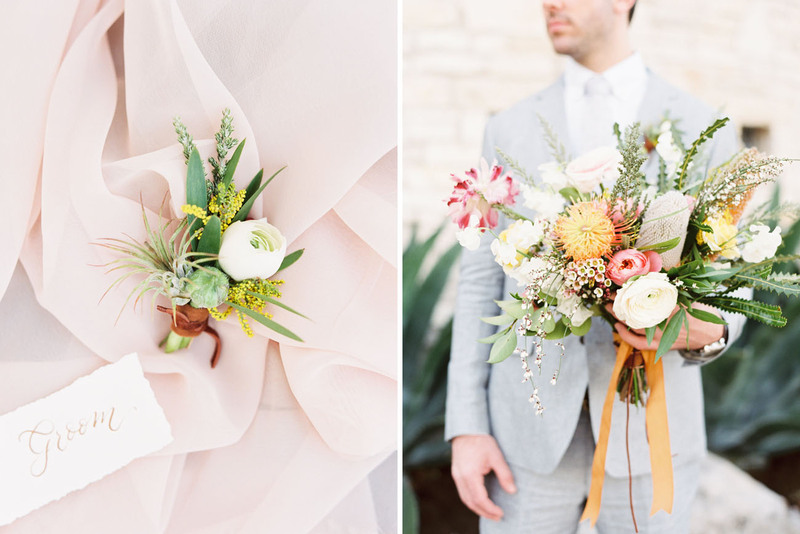 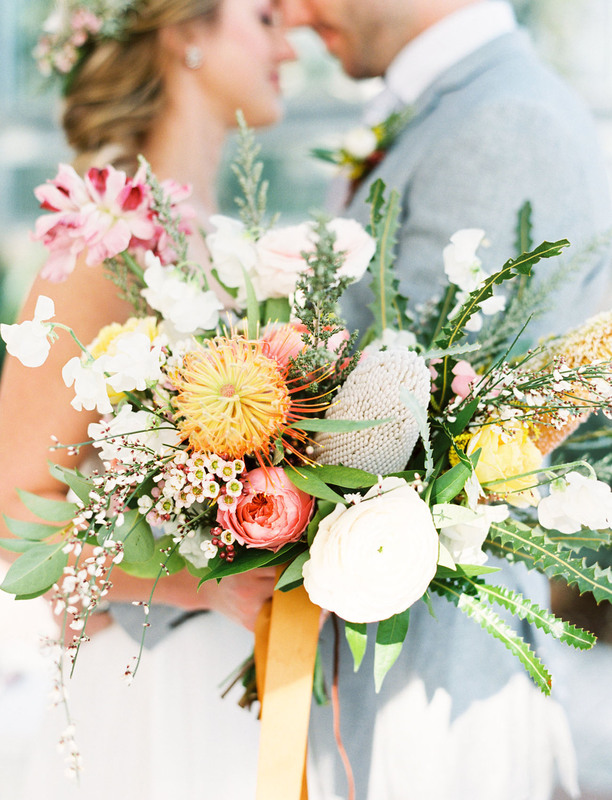 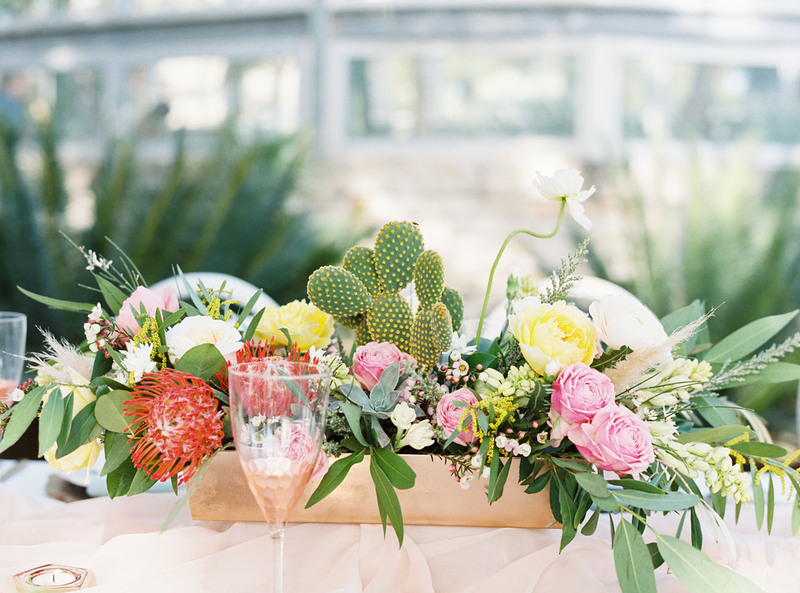 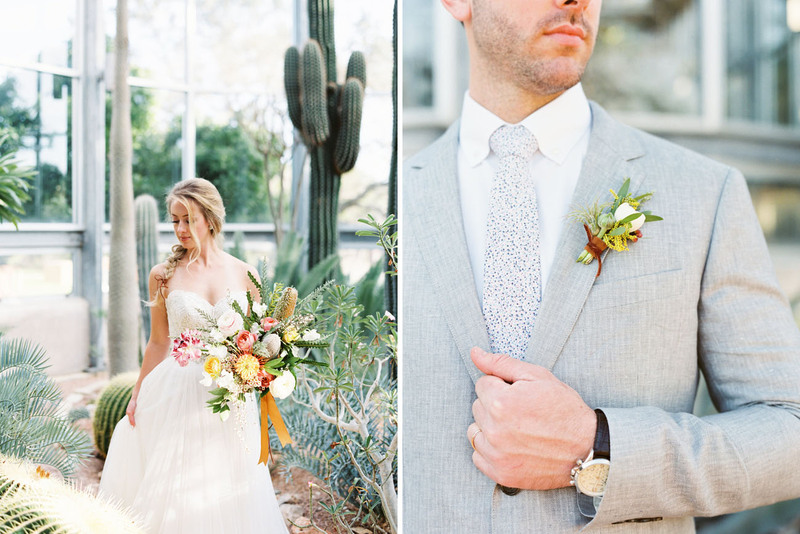 – and we are, of course, drooling over the stunning bouquet + florals by Gypsy Floral! 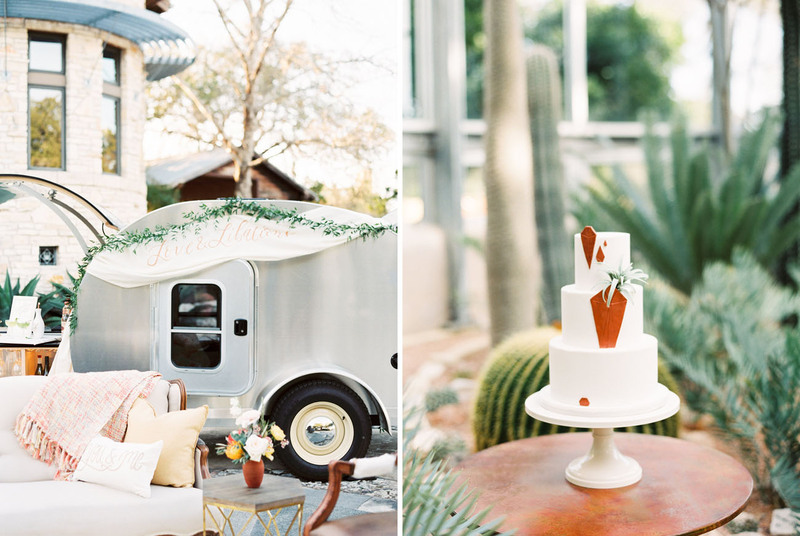 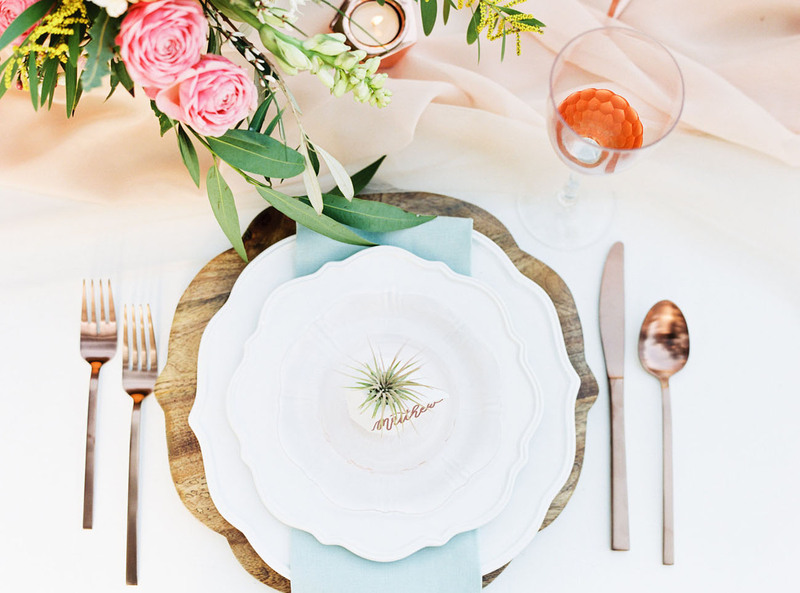 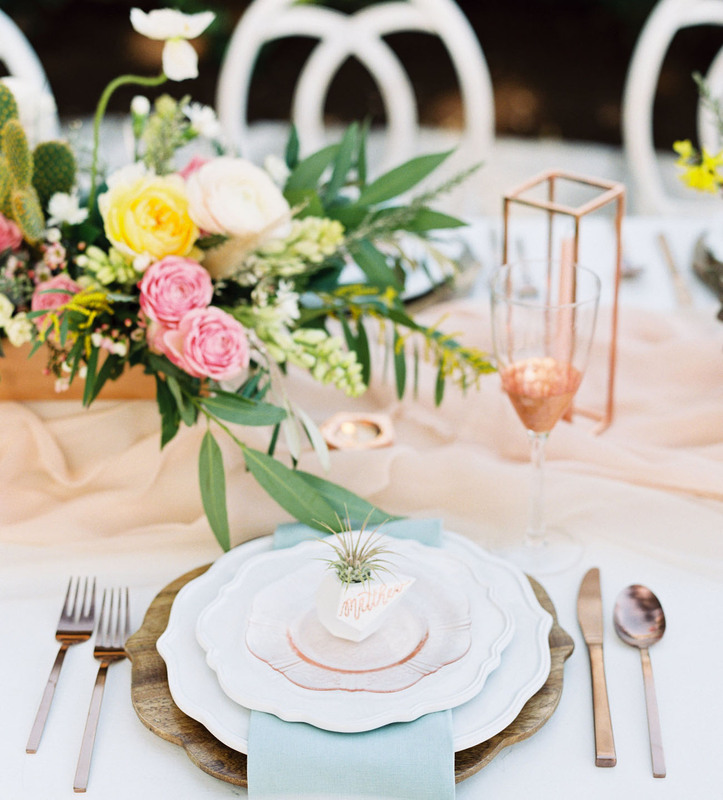 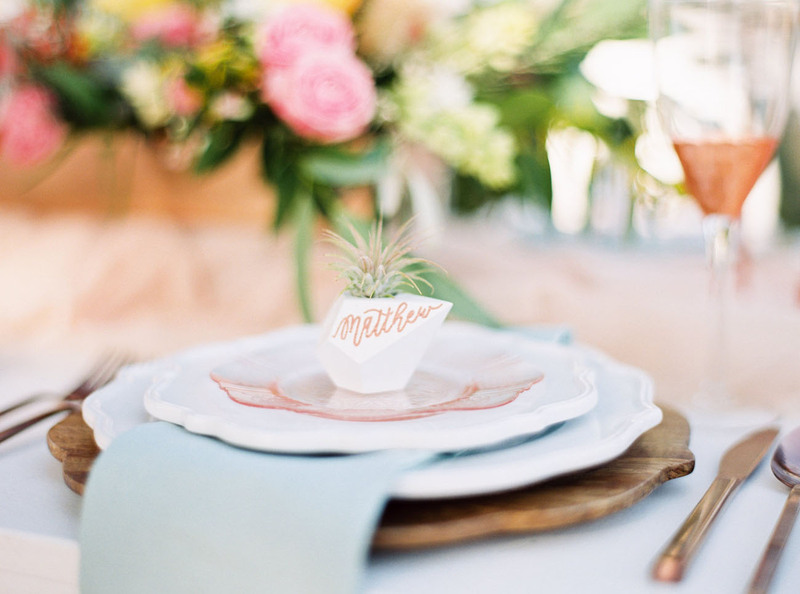 Shop this entire styled shoot in our guide below! 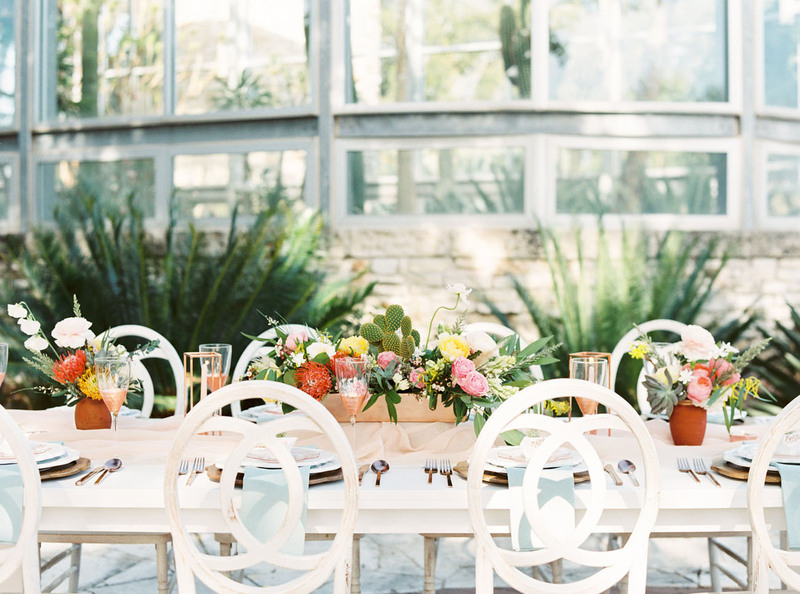 Our dinner space came to life with a white farm table and beautiful white washed French chairs which fit the style perfectly and provided a great backdrop to build upon. 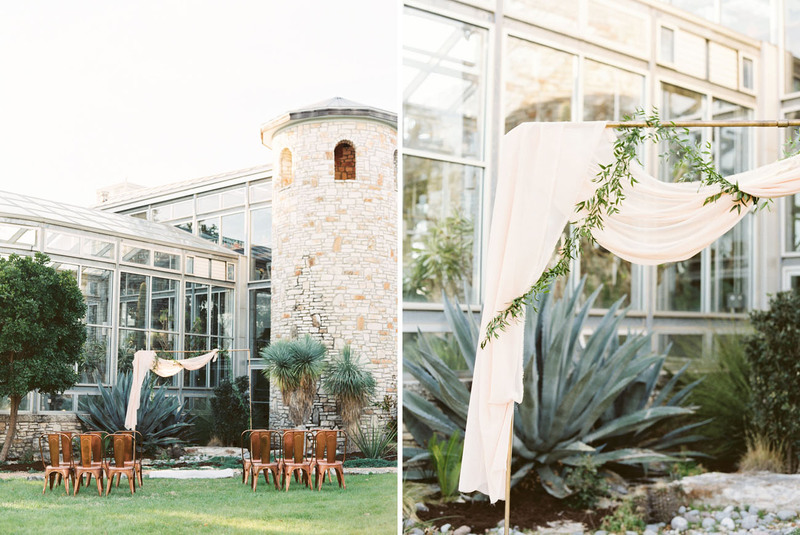 We added sheer fabric tied with leather as a palette softener. 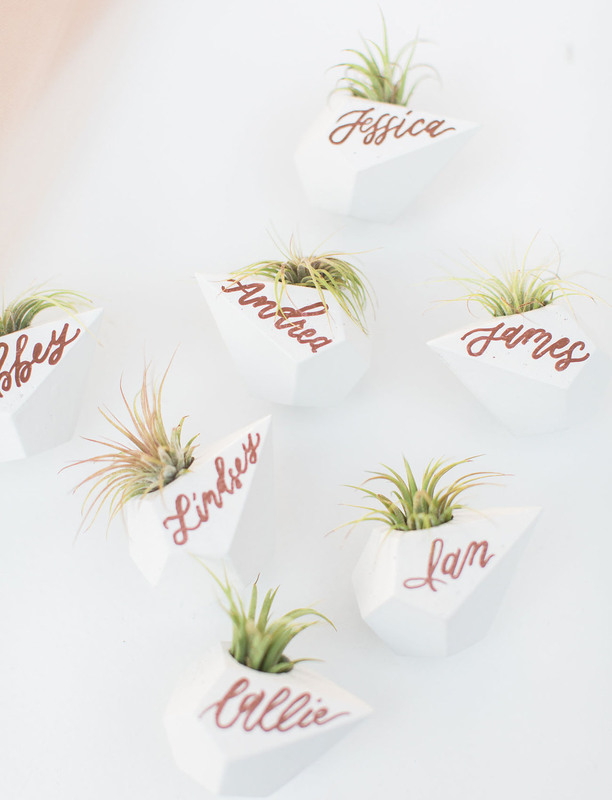 One of my favorite touches were the tiny geometric planters, by Redwood Stoneworks, painted in white lacquer, scripted in copper, and adorned with mini air plants denoting the guests seating assignments. 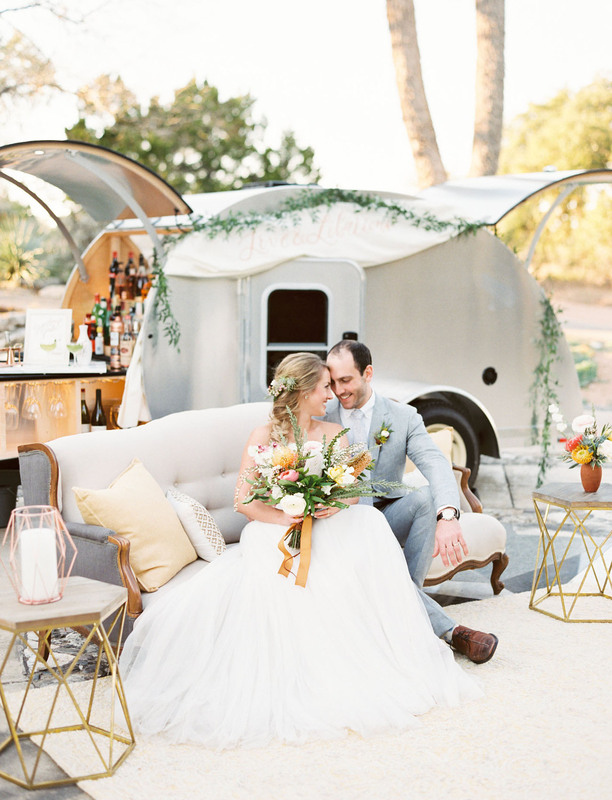 To round out the day The Liquid Movement brought along their airstream mobile bar to whip up some fun cocktails and create an inviting lounge setting for the couple to relax and take it all in. 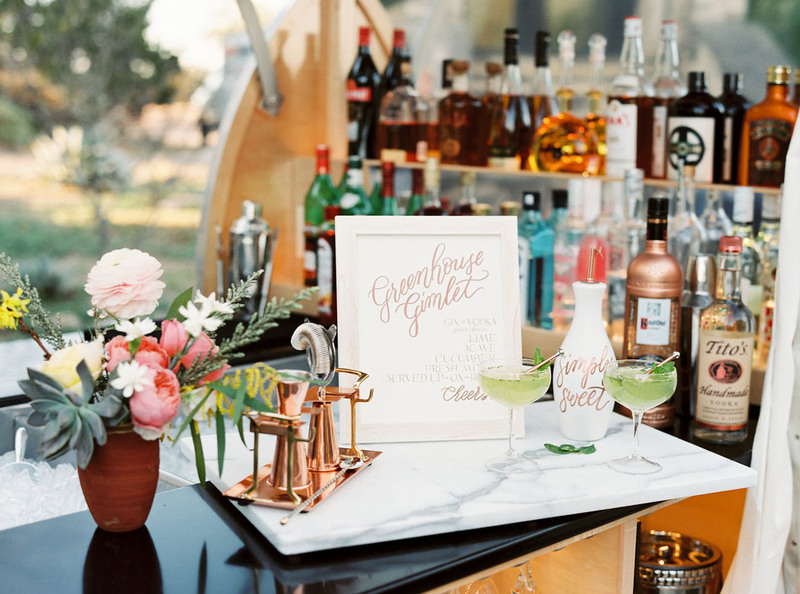 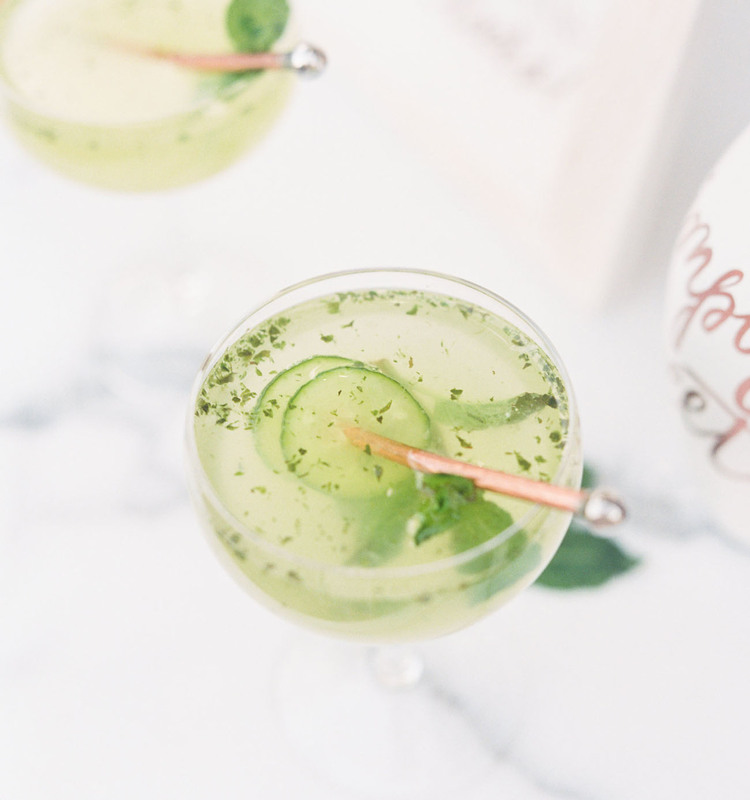 Signature sips named after the venue were the perfect refresher in the warm early spring afternoon! 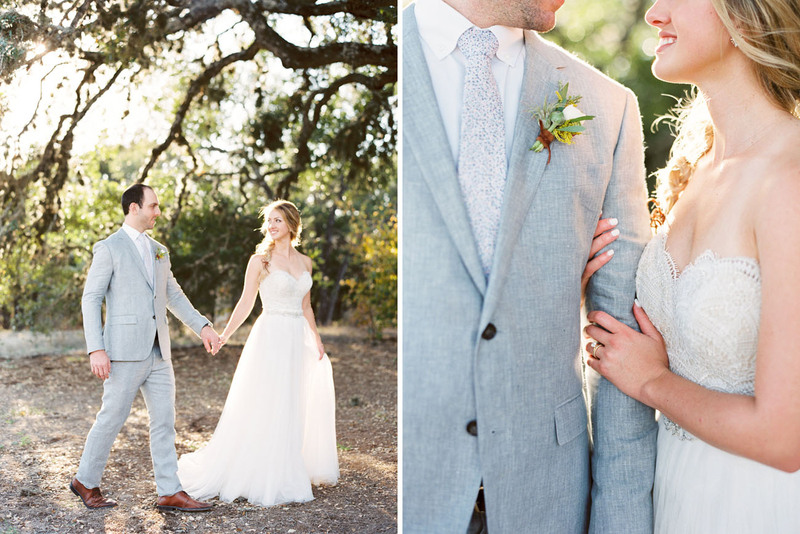 The loveliest, no? 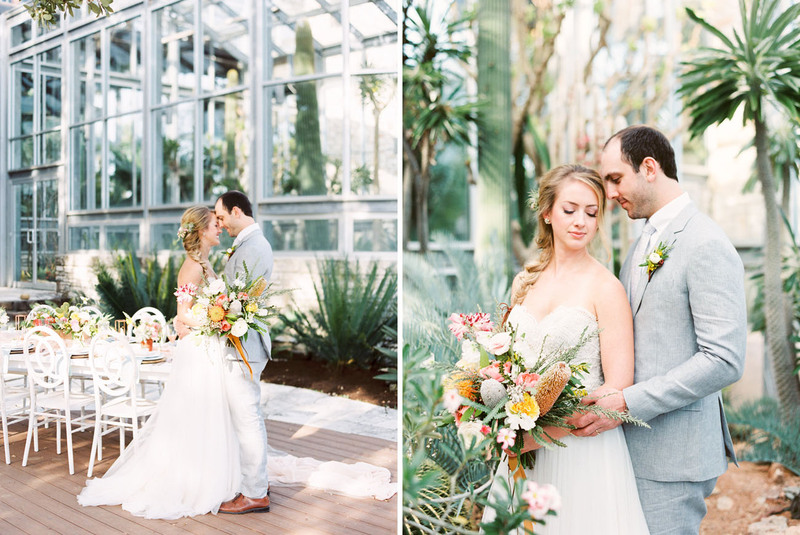 A massive thanks to the talented team below for sharing their amazing work with us today!